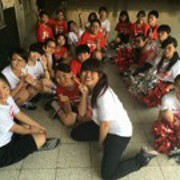 I'm a qualified English teacher in Taiwan, having experience of ten years teaching students from 8-18 years old. Currently I am working as a teaching assistant in Year 4 class. My specialty is teaching English as second or foreign language. I’m available after 4:30 on Monday, Tuesday and Friday. I'm enthusiastic and passionate, always willing to try different approaches to help my students to improve their target subjects. I apply media and technology with my teaching, so learning is more than just written words. It's a philosophy of life. I'm patient and open-minded. I believe every kid has the potential to develop their own talent as long as they find the right way to do it, and my aim for life as a teacher is to help them find their own unique way. I always find joy with the young and amazement while they suddenly click on the concepts they didn't get, or how they can reach out beyond my expectations through my instructions and guidance. I am currently a Year 4 teaching assistant. My job is tutoring Maths and English to slow learners. I also have had at least 10 years of private tutoring in Teaching English as foreign language.